"It's an unusual event," said Peter Brown, a meteor expert and professor of physics and astronomy at Western University. "We don't see things this big very often." However, because it wasn't a nuclear concern, the group simply catalogued it and moved on. The blast went unnoticed by astronomers who track meteors. Almost three months later, Brown learned about the explosion while looking at CTBTO's data. 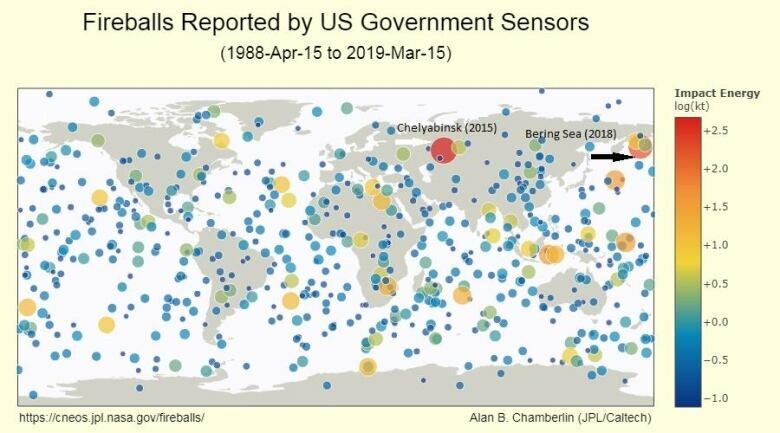 At the same time, NASA's Jet Propulsion Laboratory (JPL) in Pasadena, Cali., also added the Bering Sea explosion to its online fireball database. The blast received significantly more attention this past weekend at the Lunar and Planetary Space conference held just outside Houston. Satellites confirmed the meteor's path and explosion with images from space. Brown has some reservations about JPL's estimate that this latest meteor was travelling so much faster, at 32 km/s. "My suspicion is that the velocity is too high," he said. "But I have no data to support that." There are asteroids and comets that cross Earth's orbit, referred to as potentially hazardous objects (PHAs), but astronomers around the world are keeping a close eye out for them. 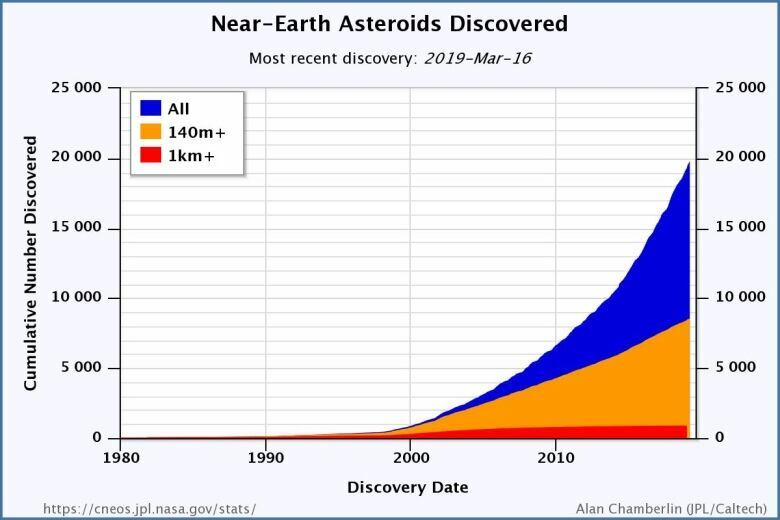 "The public should not be concerned," said Canadian Paul Chodas, manager of NASA's Center for Near-Earth Object Studies at JPL. "Because these events are normal. Asteroids impact Earth all the time, though it's usually much smaller than this size." The only reason the one over the Bering Sea wasn't detected is because it came from a northerly angle, where fewer telescopes are focused. Once in a while you may hear or read about an asteroid passing "dangerously" close to Earth, such as asteroid 2019 EA2. This 24-metre-wide rock will pass within the moon's orbit at 9:53 p.m. on March 21, but it will still be more than 300,000 kilometres from Earth. "In time, eventually they will all reveal themselves," Chodas said of the near-Earth asteroids. "It's just a matter of continuing to search for them."